Here is a lovely breakfast cake which could be made with just about any fruit. I happen to have a nice bunch of cherries in the refrigerator and thought of making either a bread or cake for breakfast. When it comes to sweets I tend to keep it very simple. And in my usual “less ingredients is best” here’s what I came up with. Preheat oven to 350°F Prepare a cake pan. Beat butter and sugar together until light and fluffy. Add eggs, mix well. Mix in flour and yogurt. Spread mixture into your greased cake pan. 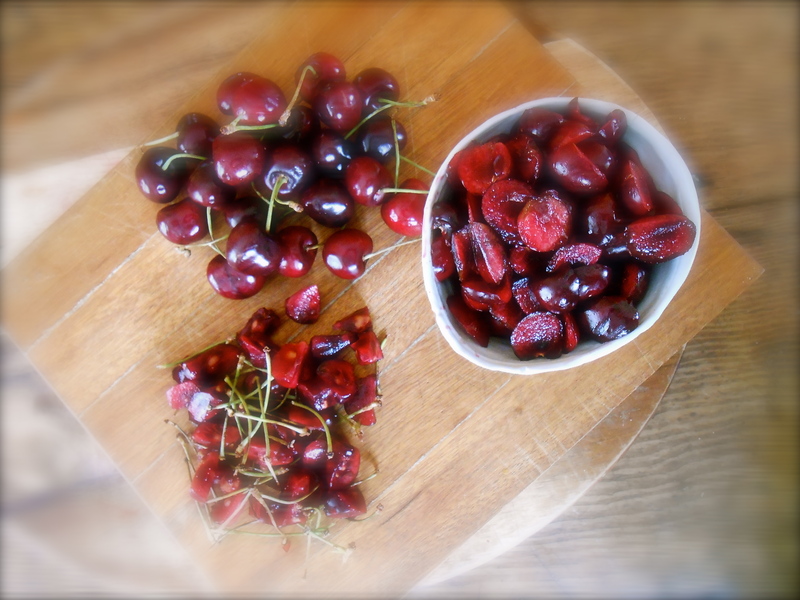 Sprinkle cherries on the top and then pat them down gently with your hand. Bake for 50 minutes or until a toothpick comes out clean. Oh, that looks so good. Yummers! This looks beautiful Seana!! Another of your recipes in my never-ending bookmark list! I can imagine this cake with blueberries, strawberries, or cranberries! I think so too! I’m thinking plums and apricots now too! The season is here for stone fruit of that sort. Thank you Felicia. You sis is leaving Friday eh? I like this recipe -not a lot of sugar and made with yogurt. I’ll have to make it soon, while cherries are still in season. The cherries are winding down aren’t they. Still some good ones to be had though! I love this recipe. So basic, easy and like your said…not sweet. Gorgeous cake and I love that it is so simple and “friendly” to different fruits. YUM! Very true. I want to make it with plums too. Thank you! Lovely indeed. I must try this (when I get my baking skills honed a bit). Yes, I guess you need to let the dust settle a little after your banana bread! :) Great post. Not much can go wrong with this particular bread/cake. This looks so yummy! I can’t wait to try! Hey…thank you. Maybe you’ll get a chance to try it?! Oooh! That looks lovely and so pretty! Thank you. Isn’t fresh fruit baked into cake and bread so good! Wow. Uh-oh, it looks so easy I’m going to have to try it. I don’t need a spring form? Just any baking pan will do? I’m going to do mine with all these plums and blackberries I have. I love the touch of yogurt. Yes! Me too and I went online to find a spring form pan. I am a novice baker and I saw darya’s post then yours. That’s why I got excited. I can make her recipe using your method and the yogurt with my own fruit! Perfect! As you know I do like my yoghurt bread. Have never tried a cake version as yet. Now, how much were those measuring cups I spied earlier? I do know how you feel about yogurt bread! Why can’t we all just have the same measurement system in the world? I have found myself using conversion charts more often these day…and thanks to you I have a pretty good one bookmarked for easy access. Wouldn’t it be so much easier! Well, for the sake of £2 for a set of plastic measuring cups I think it’ll be worth it :) Even easier than using that site, which I’ve only used for posts within WP. Hope you find it useful! What a fabulous breakfast cake! Plus, I love cherries. Me too! Especially when it is a hint in a nice glass of Pinot! :) Thank you for your comments. Cake for breakfast; you must so be my kind of person! :) Yet another of your recipes that I am most definitely going to make very soon! Thank you Kate…we do love a “slightly” sweet something or another for breakfast around here. This cake is perfectly sweetened, in my taste. Of course my son had to dust his with confectioners sugar! Such a beautiful cake! My son would love this. Putting it in my “to do” file. Thank you for sharing the recipe! Delicious. There’s nothing better than moist plain cake with fruit. Can’t wait to have more than a camp kitchen! Thanks, yes it has been an amazing trip. Full of excitement and variety, but I am looking forward to the comforts of home! I quite literally just minutes ago posted a comment on cityhippyfarmgirl about her strawberry crumble. It’s my lucky day for recipe ideas today methinks! Strawberries were $1 a punnet at our local market a few days ago, and I bought SIX punnets. I will have plenty left over from the crumble to try your cake too. It looks magnificent, and easy too which is always a bonus! I have some blueberries as well and may make a mixed concoction. Lovely simple cake! its perfect not only for breakfast! :) and photos are really nice! Cherry season is the best. It’s a little challenge to see recipes from the other side of the world when our season’s are opposite. My recipe file is growing by the numbers with things to cook two or three months from now! Just seeing this, catching up on emails. 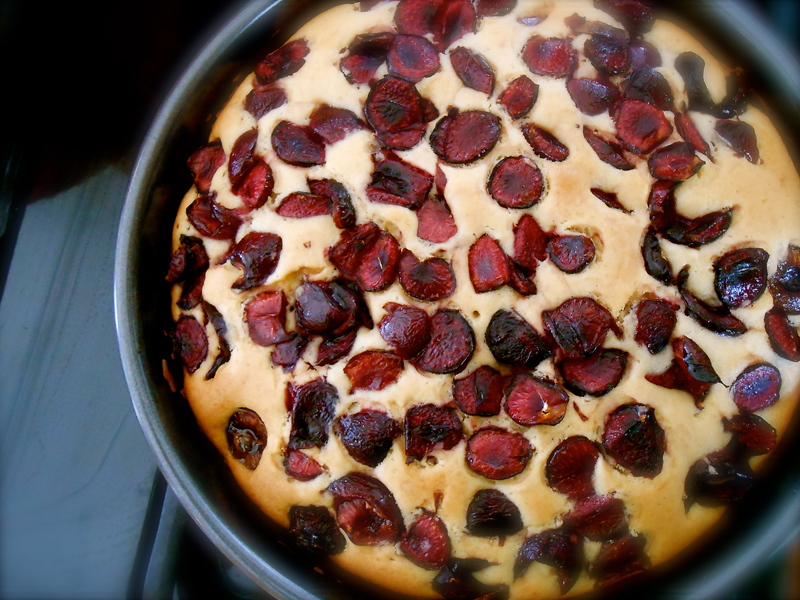 Love it, yogurt cakes is always moist and a tad tangy, the cherries are the perfect addition.! Ah! cherries! AND cake! be still my excited heart. looks really pretty too. This looks amazing! I wonder if how it would work with Greek yogurt. Thanks for this recipe! I’m not sure if the Greek yogurt would be too thick. I did try to use Greek yogurt in baking before and the cake was a bit dense, still good, just a little more firm than I would like. Thank you! Holy Toledo that looks amazing! And oh! so beautiful!! Another of your great recipes that I need to try! great photo–I could really “taste” those cherries. This is really a recipe I could use… thanks. I love pretty desserts. This is so pretty. Thank you. I am getting to the point where I only like desserts with fresh fruit baked into it, and not too sweet. This looks wonderful. It reminds me of the classic French Clafoutis – except with the brilliant addition of yoghurt. I LOVE cake for breakfast. It’s genius. I only just discovered the idea a couple of years ago when I went to Mexico for the first time. Chocolate cake and Mexican coffee amidst the flowers and sunshine…..
Chocolate cake and Mexican coffee, flowers and sunshine! Sounds like I would be very content in Mexico. :) Thank you Lindy. So proud of you :-) You’re becoming a Master in simple desserts, I love it!! Btw, I was in the bookstore for Giorgio and there it was… several editions (Sicily, Italy…) Now I’m stuck. haha… because as you know I am not a baker, and it doesn’t require much to turn out a simple dessert! :) Oh no! Giorgio has more than one? I haven’t even ventured in to that section of the bookstore. (No books for me until I recover from buying my son’s text books!!) I’m feeling like I really need his book though! Fresh inspiration. That’s so simple. I must try it! Thank you so much! You have a lovely blog yourself! This cake looks so delicious and beautiful, I love it! Thank you for this great recipe. Thank you for your kind comment, and I really enjoyed looking around your blog today. You have a very clean and tastefully presented site! You are currently reading cherry yogurt cake at COTTAGE GROVE HOUSE.